30 Day No-Hassle Money Back Guarantee, all purchases include discounted upgrades to future versions and we offer site and forever licenses. Vitamin-R is never more than a click or a keyboard shortcut away and yet it knows when to get out of your way. Vitamin-R is your faithful sidekick and after helping you set up the optimal work conditions for your task, it sticks around to keep you focused and motivated. Everything in Vitamin-R is built for speed and ease of use. Use our new single window interface to streamline your workflow or use keyboard shortcuts for most everything. Hitting the global keyboard shortcut (Ctrl-R) in any application will instantly bring up Vitamin-R.
Cut through the mind fog. How can you work effectively if you are not sure what you are trying to achieve? Why then do we waste so much of our time working towards vague goals and deadlines in the distant future? Getting things done begins with setting immediate, specific and actionable objectives. Keeping these objectives reachable ensures optimal performance and high motivation. The genius continuously churning out outstanding work is a curious, but enduring myth. Real work is much messier. For optimal performance our brain needs the ebb and flow between periods of high, but narrow focus and recovery time when subconscious pattern matching and associative thinking can take place. Vitamin-R structures your work day around alternating sets of highly focused “time slices” of 15-25 minutes followed by guilt-free breaks. 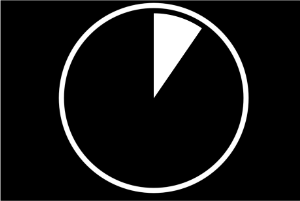 Tick, Tock, Tick, Tock, ..
During your 15-25 minute time slices you should focus only on the clear, specific and reachable objective that you just defined. 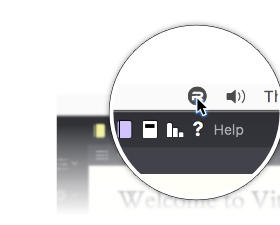 During the time slice, Vitamin-R will display the remaining time in the menu bar and trigger visual, audio and speech notifications. Vitamin-R's powerful notification system is fully customizable to provide the best possible experience tailored to your specific needs and personal preferences. Since its first release in 2010, Vitamin-R has helped tens of thousands of creative professionals, software developers and ADHD sufferers find focus, overcome procrastination and maintain motivation. Version 3 takes everything we have learned over the decade since we started this project and puts it into an easy to use package for you to discover. Not great, but still better than doing two things at once. Task switching is a big, but often unavoidable productivity killer. So when you do need to switch tasks, Vitamin-R makes it as efficient as possible and its built-in “breadcrumbing” technique helps you pick up where you left off. The Log Book allows you to quickly restore previous objectives (and their associated tags). Leaving Breadcrumbs is an effective way of making it easier to restart a task and reach cruising speed much faster. 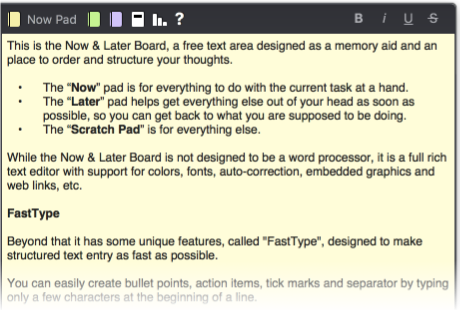 The Scratch Pad provides a freeform place to leave task references such as images, documents and hyperlinks. No matter what your drill sergeant told you, breaks are not for slackers. In fact, taking regular breaks is especially important for those working with high focus. Breaks are opportunities for renewal allowing you to keep a high, but sustainable pace throughout the day. They are also crucial to allow the intuitive, pattern matching, right hemisphere of your brain to catch up with what you have done and provide a larger context for your work. Timed breaks prevent renewal breaks from turning into free afternoons. Setting a time limit not only makes it much easier to return to the task, but it also takes the “guilt” out of them. 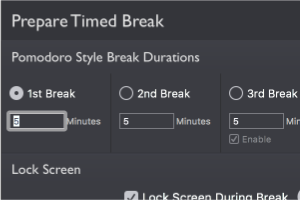 Version 3 now allows for the entire display to be locked during rest breaks forcing you to step away from the computer. Regular ergonomic rest breaks prevent repetitive strain injuries and help you recover more effectively. 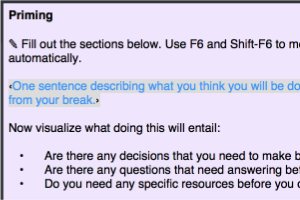 Before each rest break, Vitamin-R invites you to write down a “priming” question allowing your mind to bring its unconscious, intuitive side to bear on the problem before you have even “officially” started on it. Our short-term memory can only hold "7 plus minus 2 chunks" at any one time. Past this point, every new idea that enters our head pushes another one out. It is this hardwired limitation that causes us to “lose the thread” when we get interrupted and makes it so very hard to get back into our productive zone. Luckily the solution is simple: get stray thoughts out of our head and into a trusted system as quickly as possible. The Now & Later Board is designed for precisely that purpose. It has pads for jotting down notes about the current time slice, things to be done later and a scratch pad for everything else. Each one of us is unique. Finding out what works best for you is the key to unlocking your productivity. 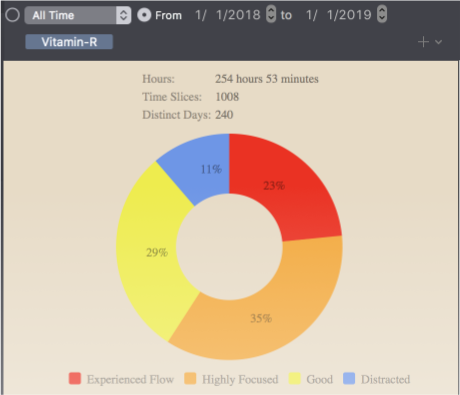 Vitamin-R records every completed time slice to its log book and leverages this information to provide insights into your own work habits, preferences and performance. 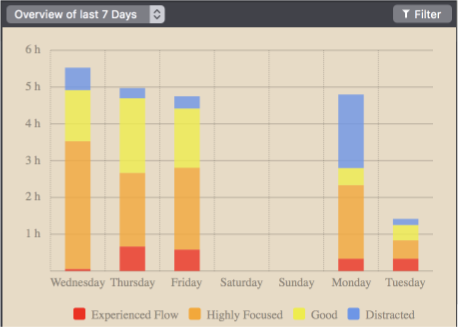 The statistics module delivers information about the amount and quality of your work in the recent past, but it also shows statistics that allow you to work out what days of the week and hours of the day your concentration levels are highest. You can leverage this type of insight to more productively structure your work day and work week. Immediate feedback increases motivation and facilitates understanding of the relationships between actions and their results. Vitamin-R exploits the information in your log book to keep you motivated by providing you with immediate feedback on how you are doing and contrasting it to your performance in recent days. This not only helps you with motivation, but it also makes it easier for you to detect beneficial as well as detrimental work habits and environments. Tags are a man's best friends. 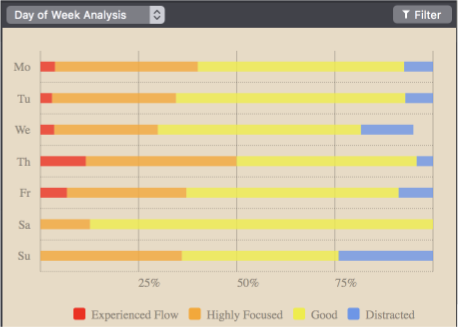 Vitamin-R's reporting and filtering feature allows you to gain insight into which activities and projects you are spending your time on. Vitamin-R uses a flexible, low friction tagging approach. You can attach simple tags (such as project name, client name, activity name, etc) to each time slice and then filter the reports based on these tags. You can even use this approach to build your own lightweight client billing solution. 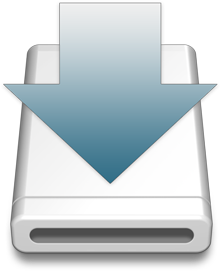 Vitamin-R is naturally also able to export your time slices in CSV format for use in an external database or spreadsheet applications. Or create the right mood. A noisy work environment can easily zap your productivity, while a quiet workspace can lack energy. Vitamin-R can block out distractions with white noise or play energizing soundscapes from busy coffee shops to relaxing beaches. The Profile feature makes sure that even the initial configuration is well matched to your needs. 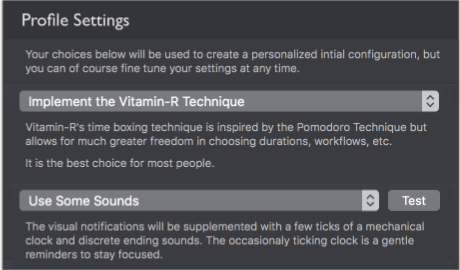 You can choose between the Pomodoro Technique or the more flexible Vitamin-R variant, visual-only notifications, some sound notifications or spoken prompts. Vitamin-R is designed to plug into your life rather than to take it over. You can use it occasionally to overcome procrastination or mental blocks or you can re-organize your entire working life around the concepts that it embodies. Vitamin-R complements rather than replaces traditional to-do list managers, such as Things, OmniFocus or The Hit List for all which direct integrations exist. Because we understand that a tool like Vitamin-R needs to adapt to your individual needs and preferences, we provide an unrivaled set of configuration options ranging from detailed control over the timing and nature of notifications to wholesale customization of your workflow. Aficionados of the Pomodoro Technique will find everything they need to implement the method: sophisticated timer, customizable workflow and notifications, log book and analysis component. Vitamin-R 3 adds Pomodoro-style (e.g. 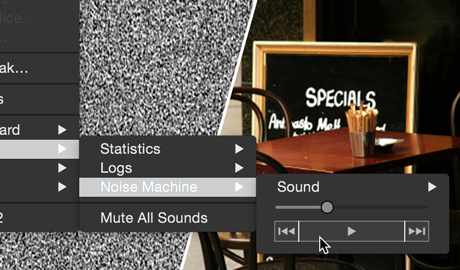 5, 5, 5, 25 minutes) break controls, a Pomodoro-specific configuration profile & a continuously ticking clock soundscape. Vitamin-R was never specifically designed with ADHD in mind. Nonetheless, many ADHD-ers have found Vitamin-R's approach to focusing attention and maintaining it with notifications and reminders particularly valuable. 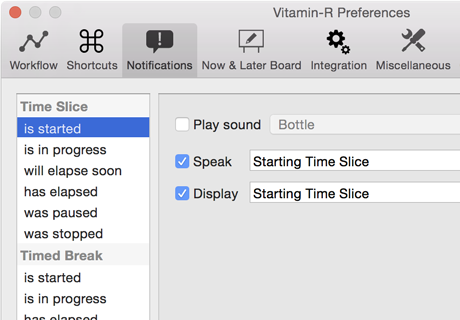 Alas *sigh* not all of our working life takes place in front of our beloved Mac, so we have created Vitamin-R for iPhone, which let's you experience the same workflow whether you are in front of your Mac or on the go. Our Dropbox-based sync is child's play to set up and seamlessly syncs your log data between your Mac(s) and your iOS device(s). 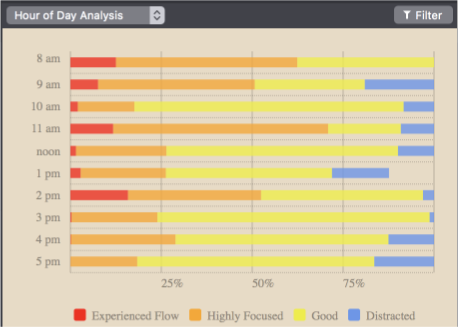 If working with higher focus, overcoming procrastination and getting motivated is of any interest to you, you owe it to yourself to at least give it a try. This trial version will expire after 14 days.